We expect health care providers to use the utmost care in treating our medical conditions. Unfortunately, treatment errors do occur and can cause significant harm beyond the initial illness or injury. 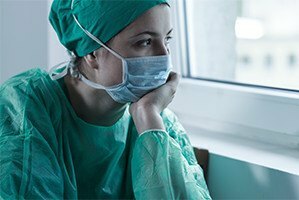 At Moll Law Group, our experienced medical malpractice lawyers are available to help you seek compensation if you are hurt or a loved one is killed by the carelessness or wrongdoing of hospitals, doctors, nurses, dentists, chiropractors, or other providers. Billions of dollars have been recovered in cases in which we have been involved. While not every treatment error rises to the level of medical malpractice, it is important to consult a Chicago medical treatment error lawyer if you suspect that a doctor's mistake has harmed you. In order to rise to the level of malpractice, a health care provider must have been negligent. Generally, in Illinois, a medical malpractice plaintiff must prove that a health care provider (an individual or institution) breached the applicable standard of care during treatment, and this breach resulted in an injury or death. The applicable standard of care refers to accepted standards and practices that other providers in the same specialty and geographic region would use while treating a similar patient in the same or similar circumstances. A standard of care can vary depending on the patient's age and the details of his or her condition. Treatment can include a wide range of actions, including a diagnosis, a prescription of medicine, the administration of medicine or therapies, surgery, and a failure to administer a particular procedure. For example, if a doctor misdiagnoses an illness and prescribes the wrong medication, it could put the patient at risk of developing another condition or injury. Similarly, if a surgeon leaves a sponge inside you during a procedure, and you are not appropriately treated during the post-op period, these injuries could lead to an infection or another injury. A medical treatment error attorney in the Chicago area can help you pursue legal action in these circumstances. In Illinois, as in other states, you will need to bring a medical malpractice claim within the statute of limitations and statute of repose periods. The statute of limitations period runs from the point at which you knew or should have known about the injury or the condition for which you want to sue. You have two years from the date you knew or should have known of the injuries arising out of the malpractice. The statute of repose runs from the date of the actual injury, and it can limit your time to sue even if you neither knew nor should have known about the injury at that time. This time period is four years. If you were injured or a loved one was killed due to a treatment error, the Chicago medical treatment error attorneys at Moll Law Group are available to pursue a claim or sue the responsible parties on your behalf. We are available to represent injured patients in Naperville, Schaumburg, Wheaton, and communities throughout Cook County. Contact us via our online form or call us at 312-462-1700 to set up a free consultation with an injury attorney.